Here at Scoot we try to keep to a posting schedule of M/W/F but sometimes people (me) are tired (always) and forget (a lot) and don’t do what they are supposed to do (oops). I’m going to blame it on the 2:45AM runDisney wake-up call and leave it at that. 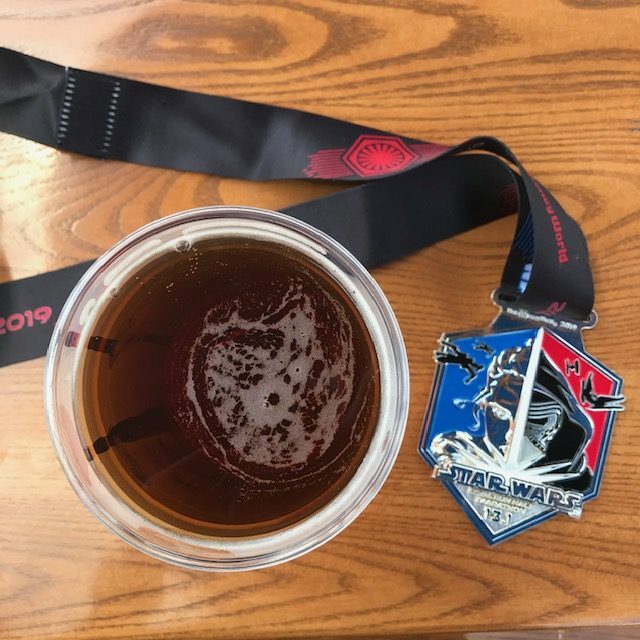 A few months ago I decided to sign up for the Star Wars race because it’s the only runDisney course I haven’t done yet. I’m not a huge Star Wars fan (shhh…) but I did watch all of the movies last summer just in time for The Last Jedi and all that. 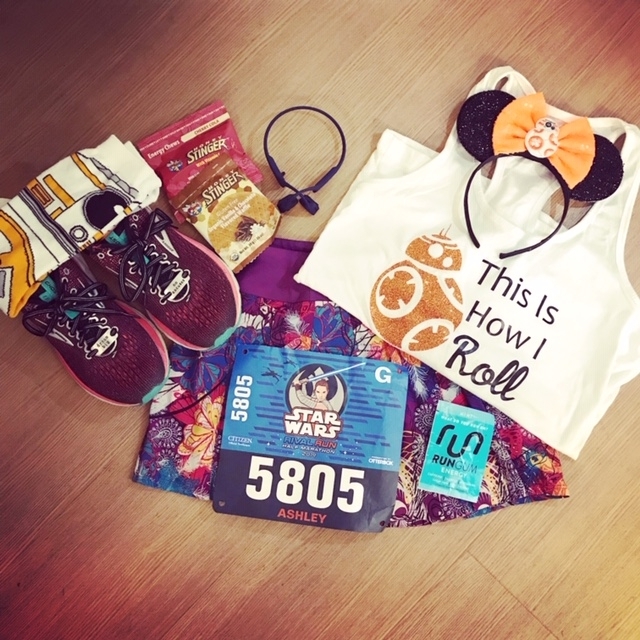 I started planning my outfit early on in the game because when it comes to runDisney the outfit is important! I decided on BB8 because he’s cute and sassy, then I paired it with my favorite Skirt Sports skirt, the Jette in Temper Tantrum. My family and I went up Friday after school since it would still give me Saturday to pick up my packet and do some park hopping. Being an Annual Passholder definitely comes in handy during race time! We stayed at All-Star Movies because, while I don’t have a problem driving, I’d rather not be responsible for my own transportation at 3:30 in the morning. On Saturday I talked my family into getting up early for Extra Magic Hours in Animal Kingdom. I’ve only ridden Pandora’s Flight of Passage once and I was hoping we’d get to do it, but no dice. We did get to ride a few things (including a solo Everest trip because no one else would ride it with me), and then we headed to the expo. After picking up my bib I made my sister take a ton of pictures of me in front of some signs that were basically the same because I need choices of what I want to post. She’s always a good sport, though. 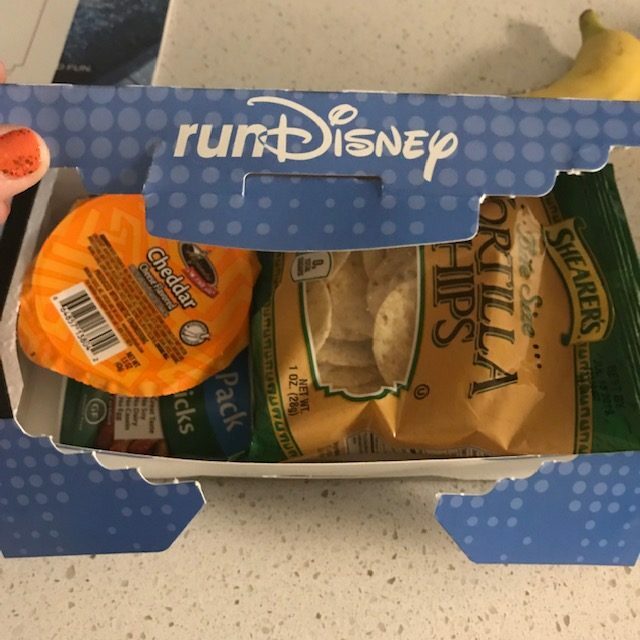 After I dropped my stuff off at the hotel we headed to Magic Kingdom for some FastPass+ usage and, obviously, snacks. I filled up on pasta at the hotel and turned in early that night. Sleep doesn’t come easily the night before a race, not because I have race anxiety, but more because I’m afraid I’m going to miss my alarm and be out a bunch of money. All of the race transportation signs suggested being at the bus by 3:30. I’d even asked the cashier at the dining area if they would be open early for runners and she told me they opened at 6:30, which is not early for runners. Thankfully we had a coffee maker in our room, otherwise the morning would have been difficult. Friday I’d had breakfast delivered to school and ordered an extra bagel and peanut butter because those are race day foods and not normally something I have at home. So I got on the bus with my coffee and bagel at 3:30AM for a run with a few thousand friends. The start line was in the Magic Kingdom parking lot and the party was already hopping by the time my bus arrived. 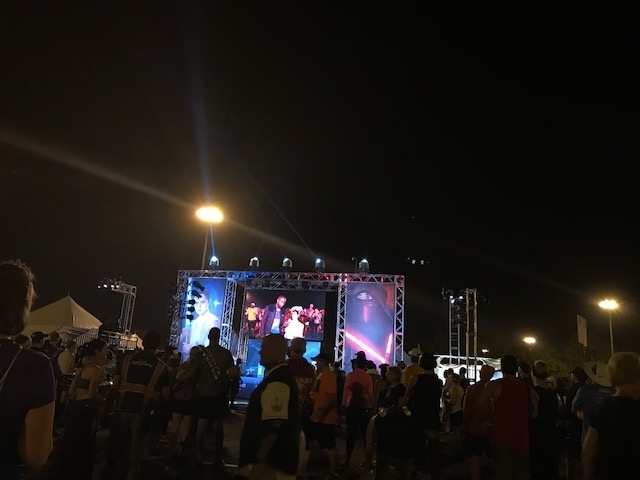 I love the energy of a runDisney race and this one was no different. I sat and ate my breakfast and watched everyone go by in their outfits and costumes, loving all of it! 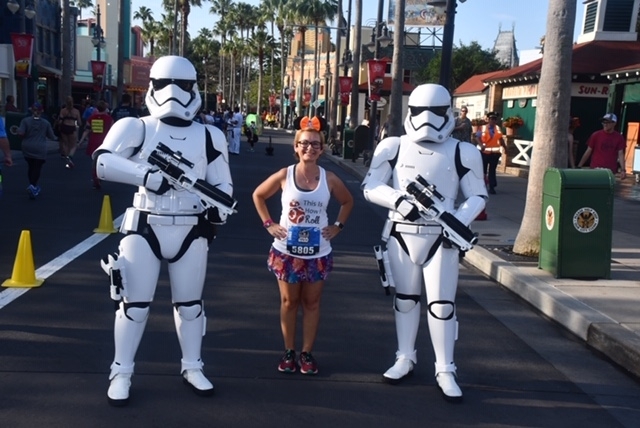 I am not one who can run in more than a tank and skirt, but I think it’s so cool when people go all out for themed races. Eventually we made our way to our start corrals and, of course, the bathrooms. My corral was pretty full by the time I got there, so I stretched and started my book I picked for the race. I wanted something I loved to keep me occupied, so a friend hooked me up with The Raven Boys (yes, this is the fourth time I’ve read/listened to it now) on Audible since it wasn’t available at the library and I had my trusty AfterShokz Trekz Airs with me. I’ve never run such a long distance alone and was feeling pretty nervous about it, so I needed to have some friends with me. My friends are the characters in the book, okay? I’m a weirdo, don’t act like you didn’t know that already. Soon enough, our corral was off and by a half a mile in I was sweating. It was unreasonably warm for an early morning jog, but we all persisted! The course for this race was different than what I’d ran before with Disney, so I was excited to see new things! 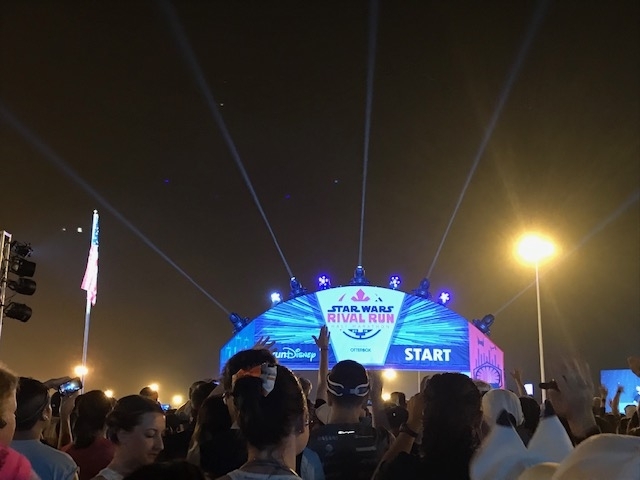 Since the race is a “Rival Run” there were a few different spots with laser lights and pyrotechnics portraying both the Light and Dark side. I ran with the Light side, which I think I picked, but I just can’t remember. I didn’t really have a goal for this race other than to finish and not get sick or hurt myself, so when the opportunity came for some fun PhotoPass ops, I definitely took it. One thing I love about being a passholder is the free pictures, and with your race bib you don’t have to worry about having someone take a picture with your sweaty phone! I stopped a few times at the character spots and tried to hit all of the photographers on the course as well. Once we entered the parks it seemed like everything just kind of sped up. The first park we ran through was Animal Kingdom, and it was amazing! We got to run through Pandora before it was fully light out and everything was beautiful. I love that Disney cast members are out on the course celebrating you, even though I’m sure they have to be there. It’s nice to have spectators when you’re sweating your face off at 7AM. After Animal Kingdom we headed into the back of Hollywood Studios with a pass by Tower of Terror and up Sunset Boulevard to Hollywood Boulevard, then out of the park. There were already guest in Hollywood Studios, so that was fun! I think a lot of people book vacations not realizing that races are happening and then just happen to see a few thousand people running through the parks. It’s always a good time. As we headed out of Hollywood Studios and to the boardwalk the course got narrow, so there wasn’t a lot of running going on, but we were all still keeping a decent pace. Not a fast pace, though. Just…decent. Of course, the boardwalk means that race is coming to and end because it takes us straight into the United Kingdom in EPCOT and you know what that means? FINISH LINE! 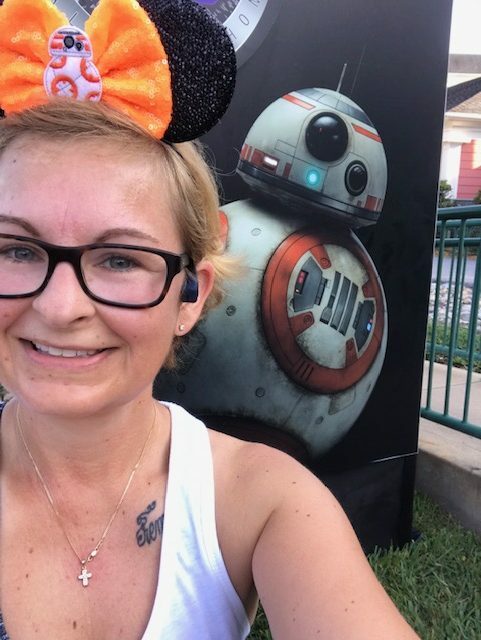 I tweeted Mer a sweaty selfie with BB8 at Mile 11. Once we got into EPCOT it felt like life was a breeze! There were a lot of guests already making their way around the park, which is fine by me. I like to think of them as our fans! I also love the PhotoPass pics in EPCOT, especially in front of Spaceship Earth. One of my favorite things to do is to tell my fellow runners to “run and smile” when I see those green tents. As we rounded the final corner into the finish line there was definitely a crowd waiting and making noise. I was still feeling pretty great because I hadn’t taken it easy, but I also hadn’t pushed myself too hard. The weather was definitely warm, but runDisney does well with keeping us hydrated. I also took some Tylenol at mile ten, so life was pretty great! 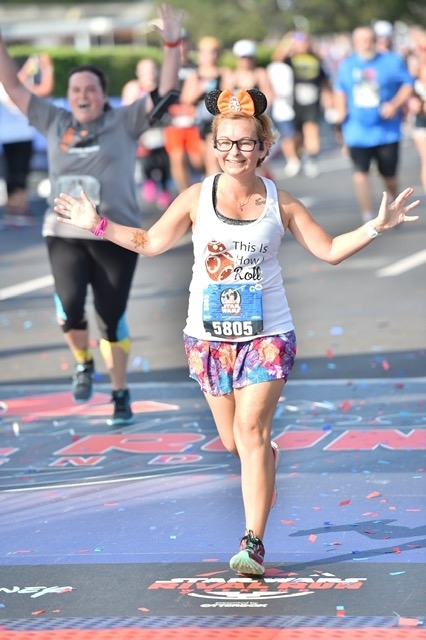 I also got a decent finish line photo which has NEVER happened for me at a runDisney race and I was really excited to see how it came out. After I crossed the finish I grabbed my medal, snack box, and “I Did It” picture, then hopped on a bus back to my hotel. I talked to a few people out of the course about Skirt Sports and even gave my discount code (SSA101Ash) to someone and managed to make a couple of friends on the bus ride there and back. This is a big deal for me as I am a socially awkward turtle and do not like talking to strangers. At the hotel I grabbed coffee and some doughnut holes because I was starving, then took a quick shower. My sister and I headed back to Hollywood Studios so I could take some Star Wars themed pictures with my medal, but what really happened was that I bought an alcoholic beverage to drink while standing in line for Star Tours only there was no line so I had to chug it. When your Disney beer costs $9 you drink all of it. 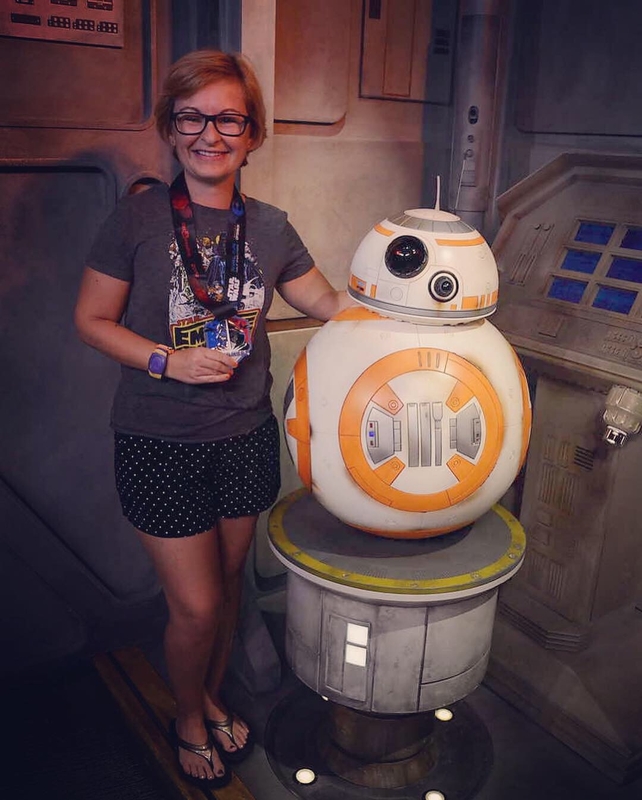 After Star Tours we stood in line for me to get a picture with the adorable BB8, who was happy to hear I ran for the Light side. We took a quick trip to EPCOT after that, but it was boiling hot and I had been up since 2:45AM and still had a long drive home to the cats. My first “Solo” half marathon was fun and not as nerve-wracking as I expected it to be. A lot of that probably has to do with it being a Disney race, however, and not something small or random. I always feel at home at Disney, as cheesy as that sounds! This was a great course and I’m glad I got to try it out. I might even return one day. Until next time…may the course be with you. 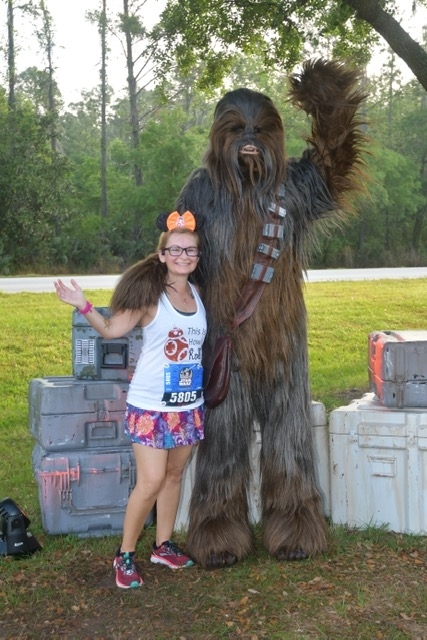 This entry was posted in rundisney and tagged ash, runDisney, Star Wars half marathon. Bookmark the permalink. It sounds like a great experience, especially for your first solo race. Glad it went well. I think a major reason I probably won’t do Disney is being up that early. I can wake up…but run…eh. UGH. IT’S SO EARLY. But they are really a lot of fun. That picture of you and the Wookie (is his name Chewy?) is AMAZING. I love that he’s basically two whole yous. Incredible!